Reigning world champion to sport traditional number 61 this season. MX2 world champion Jorge Prado reached the ripe age of 18 last week but is already talking like a seasoned grand prix pro as he vies to become KTM’s third double title winner since the inception of the MX2 class in 2004. Prado is working under the tutelage and guidance of Tony Cairoli, Claudio De Carli and his staff in the Red Bull KTM Factory Racing team for the second year in a row and for his third as an official KTM athlete. Even though his championship campaign involved impressive consistency with 17 podiums and 12 wins, rapier starts and uncatchable speed in the opening laps of motos, Prado insists he is still ‘in progress’. “I’m working hard to improve and make the right steps,” said Prado. “I’m training hard again and the big difference is this time I don’t have to handle an injury so I can be better prepared. 2018 was tough at the start and hopefully I can be more careful up until the start of the world championship. 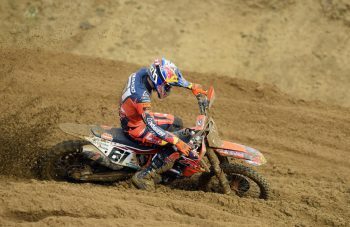 Prado has only just become old enough to vote and hold a driver’s licence, but is now charged with leading KTM’s effort in a category they have dominated and with the class-leading 250 SX-F technology. “KTM is always looking for a better bike,” he commented on the development programme for 2019 and a task that technical co-ordinator Dirk Gruebel admitted would be ‘difficult to make big steps’. “Last year it was already on a high level so to improve is tricky but the factory and the team are working hard. Prado lifted his FIM gold medal at the final round of 2018 in Imola. 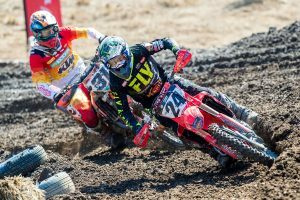 He admitted that the week after the Italian race and around the ’18 Motocross of Nations was ‘crazy’, but the thoughts of 2019 swiftly enabled the fuss and distraction of realising a lifetime dream to subside. The rider from Galicia will not run the coveted number one in 2019. Amazingly he doesn’t feel worthy of the plate. “I’m going to stick with the number 61 because I think I don’t quite deserve the number one,” he candidly admitted. 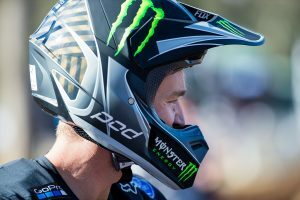 “I think the big ‘one’ is for the very best in motocross and that’s not me – it’s for the guy in the next category, the highest category. Prado is currently testing and training in Sardinia ahead of planned pre-season races in the 2019 Italian motocross championship.